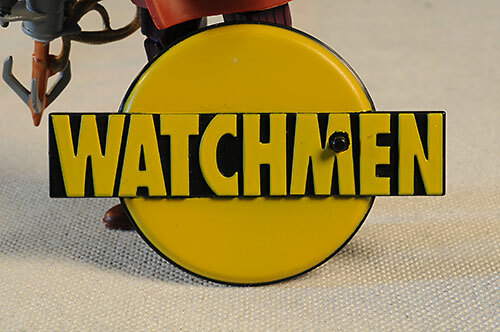 I'm one of those rare nerds who believes the movie adaptation of the Watchmen is a stronger story (because of the changes to the end) than the graphic novel. That's not to say the comic wasn't terrific - the movie was just better. That being said, when Mattel announced plans for a series based on the books to be sold through Matty Collector, I was on it like hair on a bear. 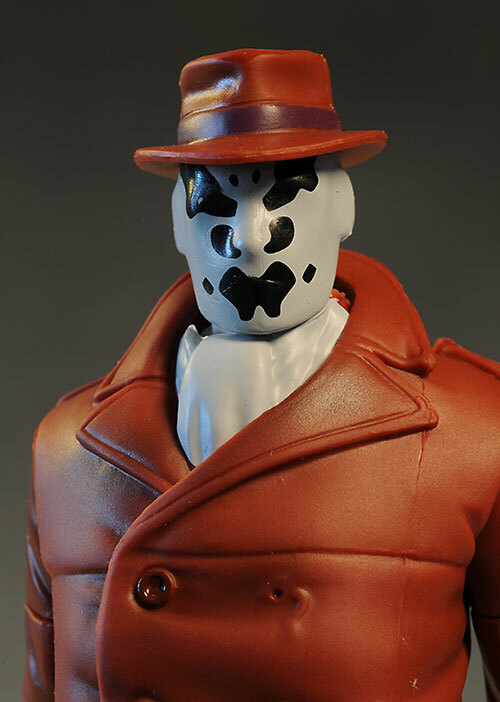 Rorschach was $25, the going price for each figure in the line in 2013. 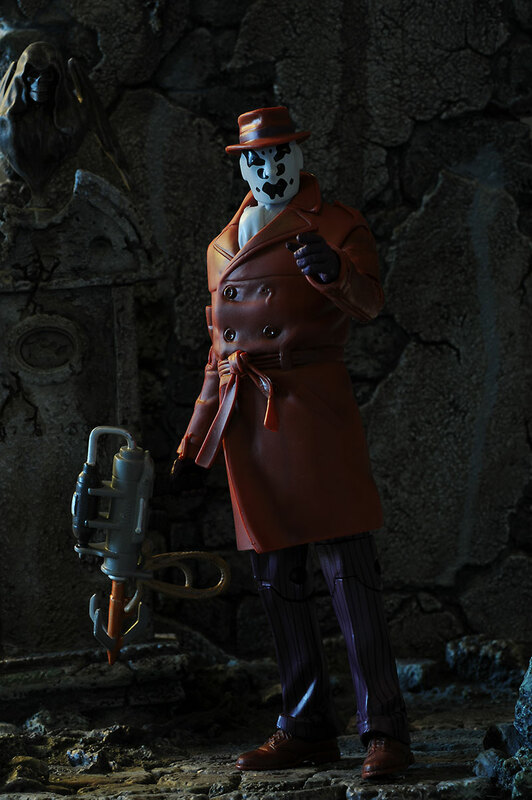 The second figure will be Dr. Manhattan, with the Comedian, Night Owl, Silk Spectre, and Ozymondias coming later in the year. For most of the collector lines sold by Matty Collector so far, the packaging has been attractive but no more collector friendly than mass market designs. 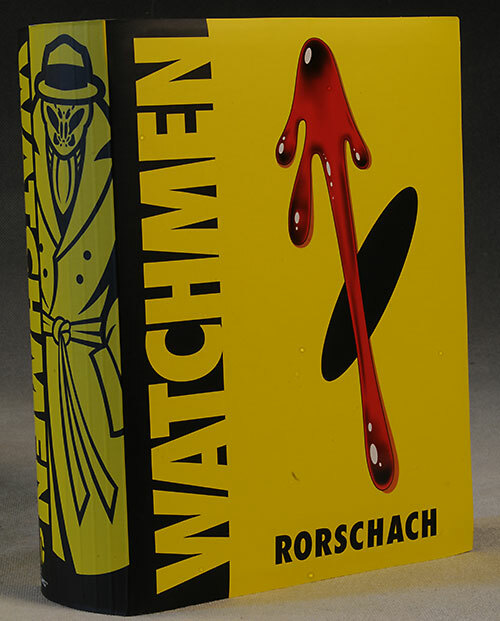 No so for the Watchmen series! They've created a very cool graphic novel-like box, with a plastic tray interior that holds the accessories and figure tightly without twisties. There's a rubber band or two, but you don't need them to hold the contents in place. It looks great, it's completely collector friendly, and it's an excellent design. These would look great on the shelf, book style. I believe this is all Four Horsemen work, and it's important to remember that it's comic style. Still, I'm not completely loving the internal scale. 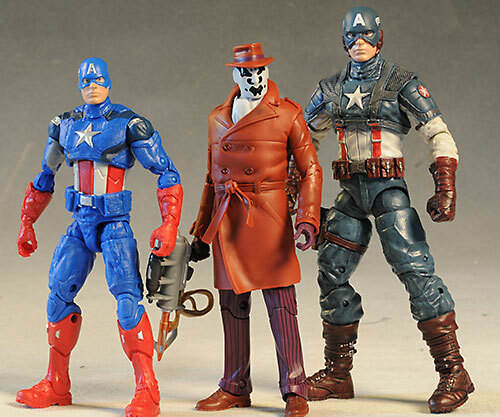 External scale is great, if you're looking to include these with your Movie Masters or some other similar 6" scale line. 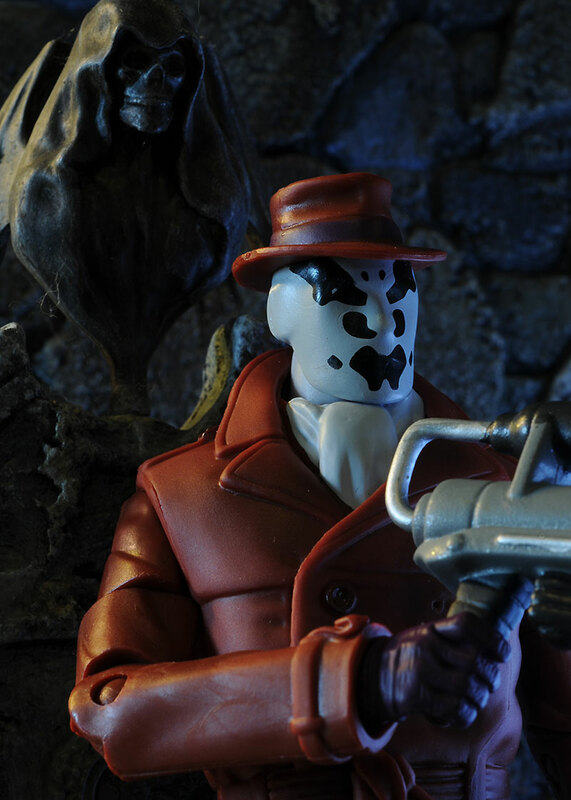 Rorschach is about 6 1/4" tall, a little big for the character, but not too extreme. 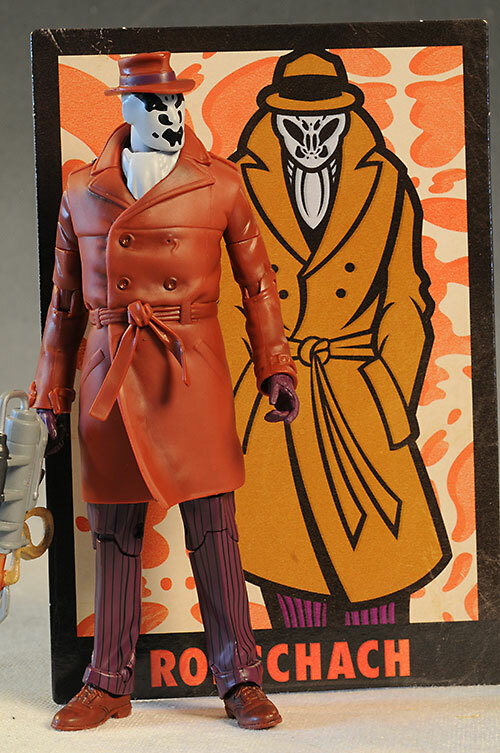 The legs are most definitely re-used from another of the Mattel suited characters...perhaps Harvey Dent. The soft rubber coat pretty much restricts the hip, waist and ab articulation, but it looks good. There isn't a ton of small detail work here, but it is appropriate for the style. I'd have gone another half star if the scale between the over sized torso and the thin arms was a bit better. The torso is more tube shaped, less triangular, and doesn't match up quite as heroically with the arms as I think it should. It's a minor nit, but pulls a half star off the sculpt score for me. He stands great on his own of course, and the hands are sculpted to work properly with the accessories. And don't miss the ripped button on the front of the coat! The paint work is solid, although most of the pieces are cast in the proper color rather than painted. The blot on the mask isn't my favorite choice in terms of pattern, but the application is clean and neat. The cravat and mask are so smooth, with no real texture of any kind, that they look very plasticky, hurting the figure a bit. The lack of any wash or paint detail on the cravat exacerbates the problem. 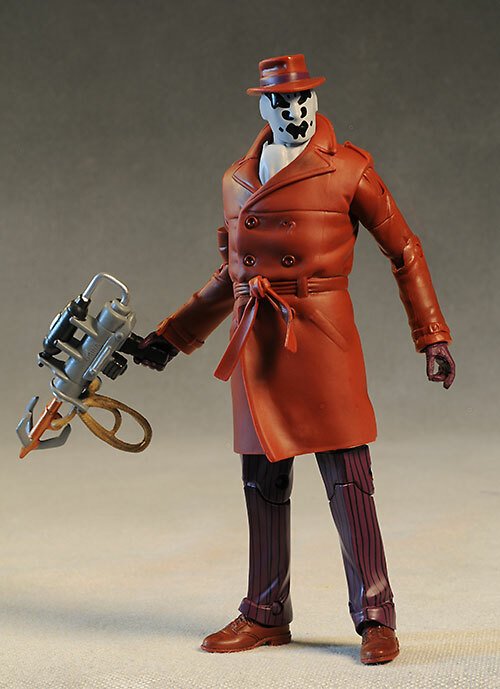 There appears to be quite a bit of articulation under the coat, but it's all for naught. The shoulders, hips, waist and ab-crunch are all very restricted, even though the coat is a fairly soft rubber. The ball neck works pretty well, and of course the pin elbows, knees and cut wrists are good. There's pin ankles too, but the sculpted pants make them much less useful. There's technically three included with this figure - a very cool logo stand, an oversized trading card, and his grappling gun. 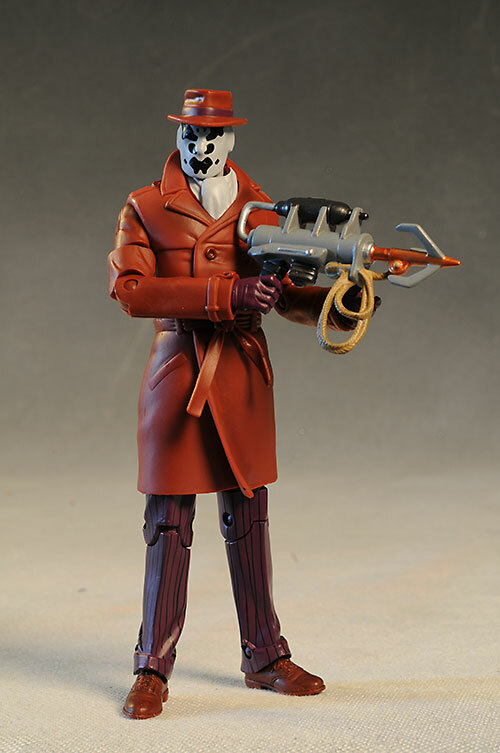 The gun is his unique item, and the sculpt and paint are good. It fits in his hands well, and looks good doing it. The stand isn't necessary - he stands fine on his own - but it will make for some nice consistency when you display the figures together. The trading card will also look good displayed behind him, but I wish they'd given us a stand, even a clear one, to keep it upright. While the figure isn't perfect, the style and design makes it a pretty good action figure. Kids probably don't know who this is, but for the fan of the books, the figure will be a lot of fun. I'm not happy with the rise in prices at Matty Collector again this year. I'll whine about it for the first 6 months, start getting accustomed to it by SDCC, and then they'll raise them again for 2014. And so the circle of life continues. I'm looking forward to this series - not as much as I'm looking forward to Mattel's 1966 Batman line, but still, I'm liking it. They'll fit in nicely with the Movie Masters, and with these having their own subscription on Matty, odds are good will get all six main characters before it's over. The second release is probably the most boring, since Dr. Manhattan is just a nekkid blue dude, but I have my hopes that the Comedian and Night Owl are going to look terrific. Matty Collector was the place to grab this one for $25 but they're sold out now. You can search ebay for a deal. This isn't the first time the license has seen figures, both large and small.